In India, Blueberries perhaps don’t garner the same attention as strawberries when it comes to whipping up ice creams, smoothies and other desserts, but it certainly has its own fan following. It is a proud member of the exclusive category of Superfoods, so it goes without saying that it has many health benefiting properties tucked under its belt. Native to North America, these wild berries have been used since ancient times to prepare stews, soups and meats. Its tarty flavour blends in well with a number of dishes, especially desserts where it is used popularly to create muffins, cheesecakes, and tarts among others. It also makes an excellent option for garnishes as the deep blue colour works effortlessly to elevate simple presentations. Talk about folklore, the Native Americans used to refer to it as ‘star berries’, which was believed to be a gift from the Great Spirit. Various parts of the plant were used for their medicinal properties, such as the leaves were made into tea which was considered to be a blood purifier, and the juice of the berries was said to treat cough and cold. The berries would be gathered, dried and preserved for the winters so that there was no scarcity. With colonisation, blueberries gained more popularity and started being preserved in bulk as the canning industry grew. Today, blueberries are available in the fresh form (which are often fairly expensive in India), canned, dried and as compotes. Blueberries are a powerhouse of antioxidants, especially anthocyanin, which gives it its deep blue colour, as well as helps in removing free radicals from the blood, and thereby protecting the body from developing various diseases, including cancer. It is said that blueberries have the highest antioxidant capacity among all commonly consumed fruits and vegetables. And its regular consumption is found to not only help the cardiovascular system, but also protect against neurodegenerative diseases and digestive diseases. A study done by Oregon State University found that resveratrol in red grapes and pterostilbene in blueberries could help boost the human immune system by raising the activity of a gene called human cathelicidin antimicrobial peptide, or CAMP gene, which is involved in immune function. The CAMP gene is the subject of much study, as it has been shown to play a key role in the “innate” immune system, or the body’s first line of defense and ability to combat bacterial infection. The innate immune response is especially important as many antibiotics increasingly lose their effectiveness. Moreover, the flavonoids present in blueberries also have anti-inflammatory properties and can significantly reduce the risk of catching cough and cold. According to a paper published in the journal ‘Public Library of Science (PLOS) One’, eating wild blueberries can diminish the adverse effects of a high-fat diet. Wild blueberries or bilberries are smaller than the usual blueberries and more acidic in nature. Researchers at the University of Eastern Finland found that wild blueberries were shown to have beneficial effects on both blood pressure and nutrition-deprive inflammation. Low-grade inflammation and elevated blood pressure are often associated with obesity-related diseases. “Bilberries constitute an integral part of the Nordic diet and they could be better utilised also elsewhere in the world,” said the researchers. Because blueberries are loaded with antioxidants, they help keep a check on the cholesterol level. Studies have revealed that these components help improve blood fat balance and prevent clogging of the arteries. Moreover, these flavonoids aid in lowering blood pressure, thereby cutting down the risk of heart diseases. As such, they are good for the heart and promote heart health. Studies have found that regular intake of blueberries helps in boosting brain health. The miraculous components present in blueberries work towards improving memory, as well as slowing down the risk of cognitive diseases related to age. 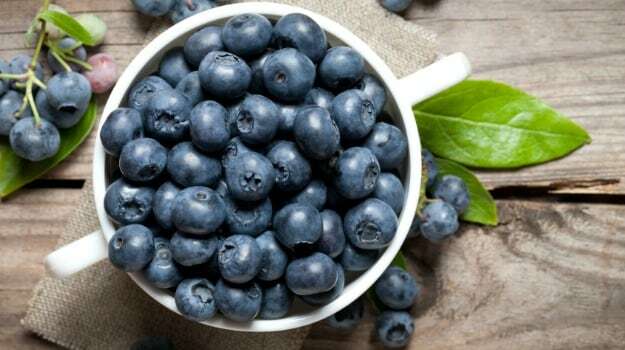 A study found that men who ate fruits such as blueberries along with other foods rich in flavonoids were found to be 40 percent less likely to developing brain diseases like Parkinson’s. And those who ate berries at least once a week could cut their risk of developing the disease by a quarter compared to those who never ate them. Blueberries also help in lowering the risk of oxidative stress in our nerve cells, thereby making them function smoothly. Several studies have found that blueberries are beneficial for those suffering from blood sugar related problems such as diabetes and insulin resistance. These berries help in regulating the sugar level and are also good for those with obesity. They have a low GI value (glycemic index), and one to two cups of blueberries, along with other flavonoid rich fruits can give you the much needed health boost when consumed regularly. Blueberries are a great source of vitamins and minerals, particularly Vitamin C. It is also low on sugar content; one cup of blueberries is said to contain 15 grams of sugar, which is equivalent to a small apple, and its bioactive compounds nullifies any negative impact of the sugar. Blueberries are a good source of dietary fiber as well and aid in digestions too.